Wherever on this earth that people live, someone will eventually say, "let's put on a show!" The human desire to sing, dance, perform, (and chitchat in between scenes!) is unstoppable. I've been a part of the Light Opera Company of Salisbury for seven years - (though this year I'm taking a break from performing) -it's provided me a social life, a creative outlet, and the opportunity to dress up and sing and dance in front of all my friends and neighbors! 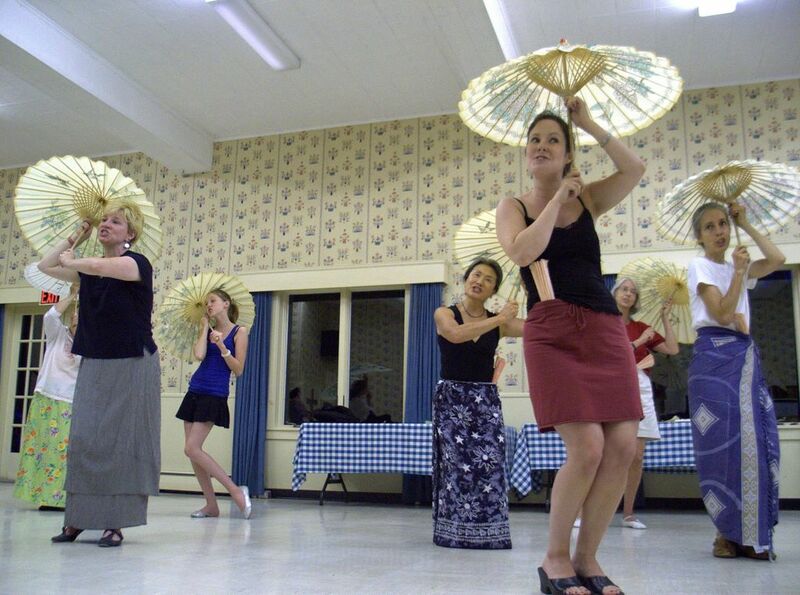 This is from last night's rehearsal for the upcoming production of Gilbert & Sullivan's "Mikado." As always it was hard to pick just one shot to share, but I loved this one because it shows what I love so much about communit theater - people of all ages, really throwing themseles into it. IN that church hall is a director of a historical society, a retired gym teacher, a high school student, and a movement therapist. They all have beautiful voices, by the way! very kewt - and neat to see people of all ages engaging in the activity! Wow they are soo cute! Those little umbrellas are very endearing! Ok, I admit it, I adore the pic AND the commentary, which added together is a fusion of story telling. 'No comment' wouldn't have helped zip! So, Jenny 2-NWM 0!! So great! My husband and I are going to see The Mikado for the first time on Saturday (we are blessed to live in a very fun college town with a great Music School). Now I'm even more excited about it! Good luck to all on your performance! I miss community theatre! No stress, well, not as much. Oh, Stewart got the message! LOL! He really cracks me up. Community Theater is a load of fun (if you stay out of internal political messes)! Your right, the range of people you meet is great. This picture takes me back! Great shot! Jenny I LOVE this shot, seriously, you captured a lot of things in it. I enlarged it and looked again it has culture, personality, spontaniety, life and beauty in it. VERY nice!